Every employer or human resource specialist in charge of hiring can agree that the ideal job candidate exhibits more than simply a high level of explicit knowledge within his or her given field. The ideal candidate also possesses a network of intangible skills that enable him or her to implement said knowledge with interpersonal grace, professional poise, and delicate efficiency to facilitate the achievement of outstanding objectives. We often call these extraordinary qualifiers “soft skills” – a phrase so ubiquitous and simultaneously so elusive to define. So, what exactly are soft skills? Soft skills are known by many names – you’ve likely heard them referred to as 21st century skills, non-cognitive skills, transferable skills, or even emotional intelligence. In the world’s ever-increasing social labor market, interaction with others in the workplace on production or design teams or outside the company with customers/clients, soft skills have proven to be vitally important to the success of workers (World Economic Forum’s Global Challenge Insight Report, 2016). In 2016, LinkedIn’s in-house Economist Guy Berger, Ph.D., surveyed 291 hiring managers to find evidence of the increasing demand for soft skills. He found that 58% of hiring managers said job candidates did not have the necessary soft skills, and it was limiting their company’s productivity. The demand for soft skills by employers is certainly increasing, so why isn’t higher education evolving to meet this need? Our guess? The development soft skills in students is a difficult target to hit. For one, the scope of soft skills is far-reaching. Soft skills encompass an assortment of abilities, not limited to cooperation, empathy, cultural competence, creativity, critical thinking, and adaptability. These skills are anything but soft – they enable individuals to define relevant and ever-evolving problems, cooperatively generate culturally inclusive and creative solutions, and reflect on how impactful and effective this work has been, only to begin the cyclical process again in light of new insights. As educators, we recognize the challenge of developing these skills in our students and recognize how crucial it is to do so for the sake of our future generations and the inherited world they will continue to develop. What is ironic is that the highly developed and very efficient classical lecture-based classroom model of education, featuring a one-to-many knowledge transmission format, is not conducive for the active learning that develops soft-skills. One example where active learning is created in the classroom is the structured peer interactions that Professor Eric Mazur of Physics at Harvard uses to get his students to be active learners. Another example as we have written about elsewhere is the flipped classroom. Perhaps the most powerful way to get students to be very active is an internship, particularly a paid internship where both the student and the workplace have something at stake. Here, active contextual learning is a powerful supplement to the knowledge from the classroom in developing soft-skills. In this environment, students are also more often in a one-on-one or small group setting that requires them to be fully present, communicate content verbally and non-verbally. They instantly recognize their place within the team, understand the context of the work itself, and execute. These are precisely the skills that employers complain must be taught to college students before they can become productive, even as they say our students have good theoretical/factual knowledge. One can even bring this internship experience right into the classroom as the University at Albany is doing now with virtual internships in cybersecurity with a company called iQ4. We think all of this is natural, even brain natural, and JS has written a recent book about the subject, Education That Works (2017). It appears our minds are constructed not only to learn explicit knowledge, but also to simultaneously learn about the importance and context of that knowledge, often from each other in social or work groups. Oscar Wilde famously said that a cynic is “a man who knows the price of everything and the value of nothing.” It is the value or the contextual meaning of our knowledge that allows its transfer to new situations and consequently drives decision-making when faced with new problems to solve. 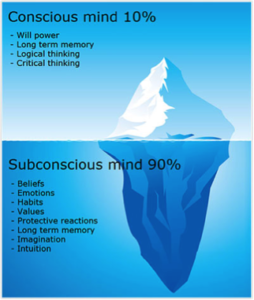 We actually believe that there are at least two functionally different systems in our heads as the diagram below shows, using a common iceberg analogy to an iceberg. The first system is the one we are most familiar with, the one that we can sense processing information with awareness as conscious thinking beings. The other system is involved in more unconscious decision-making and has been the subject of many books (e.g. Incongito by D. Eagelman and Thinking Fast and Slow by D. Khaneman). It has its own behind-the-scenes system for processing our emotions and observations into stored impressions or memories that influence our future behaviors. We believe that to cultivate sophisticated soft skills, such as wisdom, the brain uses both systems. What we would like to explore now is a theory that somehow, in ways that we do not yet understand, soft skills are a result of these two processes – not just the ability to read another person’s emotions (already challenging to some of us) but to begin to develop a kind of wisdom about that information that takes us away from the cynic mentioned above. For example, in two previous two-part blogs on wisdom by other co-authors, we mentioned the importance of interconnectedness and reflection/knowledge-fluency. Here We would like to present three possible ideas about how conscious and unconscious decision-making process might interact in the brain. This could lead to insights in how education might work to generate and intentionally teach soft-skills such as wisdom in students. In this scheme, the two systems function independently. For example, picture the two processing structures Kahneman calls System 1 (Thinking Fast) and System 2 (Thinking Slow) in his 2011 book, mentioned above. In the case of intuitive decision making, or System 1, your mind automatically and unconsciously makes a judgement that is influenced by emotion, instinct, and your prior experiences. In contrast, System 2 is functions more deliberately to analyze a situation with effort and to make a decision based on rational conscious thought. Could they just function independently and not interact until a decision must be made? Eagleman proposed that our brains have specialized, what he called, “zombie systems,” which efficiently process information “incognito” or below the surface of our conscious awareness like the iceberg. He believes that our rational and emotional minds function as a team of rivals conveying constant two-way feedback between them. These unconscious neural networks compete, and the tipping point winner of this battle is found in our behavior. Our thought becomes conscious when “zombie” subsystems conflict to the point of a stand-still. To make a decision, it’s as if our mind requires a meditator. In this case perhaps our conscious reflection, takes into account both its rational and the “zombie’s” emotional sides of the argument. What if the dichotomy between unconscious and conscious thought was not a split at all, but rather a continuum? Picture a number line. Let’s say where -10 would be you have unconscious thought, representing our automated intuitive decisions. At the other end of the line lies +10, or in this case conscious rational thought. In the course of a day, you make completely unconscious choices as if you were on autopilot, and very rational choices based on objective facts. However, in the middle way some decisions require a mixture of the two, integrating content into seemingly intuitive processes. None of these ideas may work and many philosophers, e.g. David Hume (who said the will is a “slave of the passions”), have pondered rational thought and how it combines with emotion. Our point here is to encourage the discussion of how the higher educational system might better approach teaching of wisdom and other soft-skills through the techniques of experiential education. Later, in future blog posts, we hope to explore these theories in support of developing soft skills in the minds of undergraduates who will need it to thrive in the today’s workplace.